So, I didn’t just crochet that little pink dress for fun. I did it because we’re expecting a baby – a baby girl – in January. I’m so excited! And the little girl crochet train is just getting warmed up. I took a break from the baby blanket (really, really tedious at this stage) to make another dress, this time of my own design. I think it’s gorgeous. Even Greg is impressed. I mean, he was really taken aback by this little frilly, lacy thing that I could create. You would think that with all the cool things I’ve designed over the last few years that I couldn’t surprise him that way, but I guess lace is different. Crochet really lends itself well to some beautiful lace, too, so I’m looking forward to exploring that some more than I’ve had the opportunity to do before. I took notes. 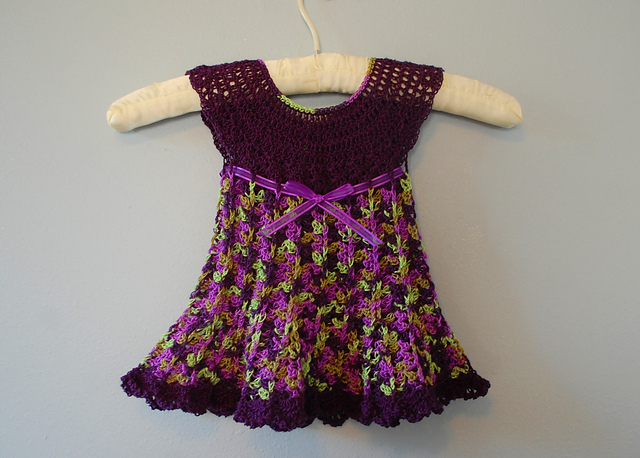 If I can figure out the sizing I’ll get this little dress into testing as soon as I can so that I can make the pattern available for anyone else who’s in the mood to hook something frilly! That’s super adorable!! I haven’t been crocheting much lately but I would totally pick up the hook again to make this for my little niece!! can’t wait for the pattern! Congratulations! And the dress is lovely, too. After all those beautiful boys, a girl! Yay! So glad you’ll get to experience the fun and difference girl can make!And ohhh the pattern! Hopefully it will be soon, my lil is getting huge! Love this little dress. Would love to be notified when pattern is available. Congratulations. I’m looking forward the beautiful dress pattern.